As part of our farm unit I wanted to do a sort of animals by where they lived. I thought it would be something both my 2 year old and 4 year old would be able to complete on a different level. They had a lot of fun with our animal habitat sort and it was an easy set up activity for me. To set it up I grabbed two buckets and the On The Farm, Not on the Farm signs (you can find those HERE) and stuck the signs on the buckets. Then I went through our animals and grabbed a bunch and dumped them in a pile in the middle. My girls love these Toob Farm Animals. We have several different sets but some of the sets I included in this activity are Arctic Animals, Pets, and Jungle Friends. I divided the pile so each girl had a group to work with and sort. They took turns picking an animal and deciding if it lives on a farm or lives somewhere else. This was so easy for my 4 year old. She sorted her pile quickly and correctly. My 2 year old struggled with it a little bit but could easily identify farm animals when she picked one up. After they sorted the animals, I had my 4 year old work on the paper sort that comes from my Farm Preschool Unit. 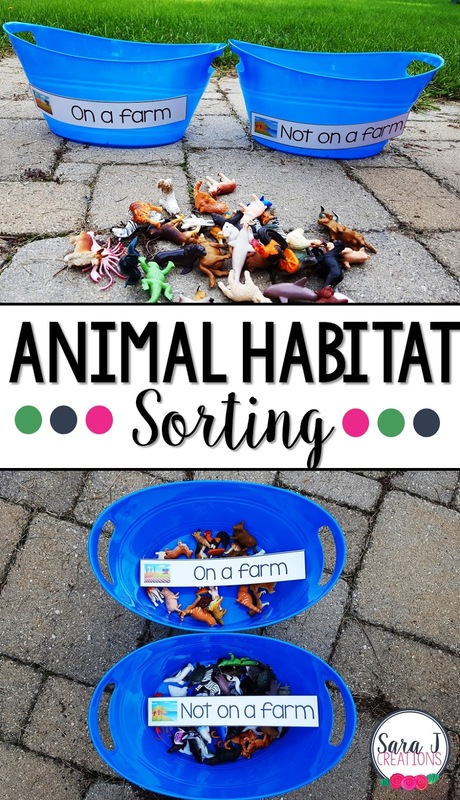 This would be a great followup activity or could replace the sorting activity if you didn't have toy animals to sort. Looking for more farm ideas? This animal habitat sort activity is part of my Farm Preschool Pack that you can find HERE. Also, check out our favorite farm books HERE and our FREE Farm Graphing Activity HERE.